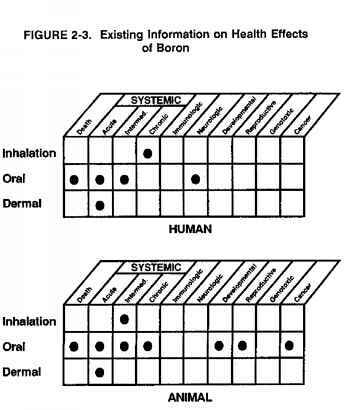 The existing data on health effects of inhalation, oral, and dermal exposure of humans and animals to boron are summarized in Figure 2-3. The purpose of this figure is to illustrate the existing information concerning the health effects of boron. Each dot in the figure indicates that one or more studies provide information associated with that particular effect. The dot does not imply anything about the quality of the study or studies. Gaps in this figure should not be interpreted as "data needs" information. Most of the information concerning health effects of boron in humans is found in case reports of accidental acute and intermediate ingestion of boron. 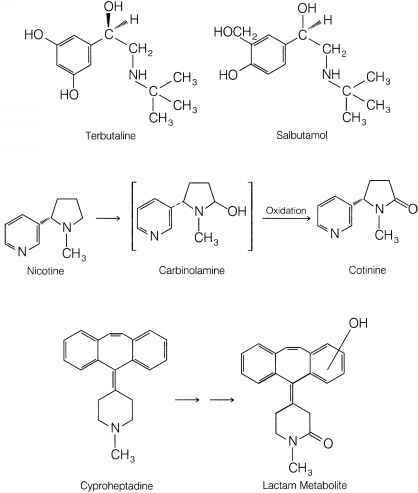 No information was found on effects after chronic ingestion. Those effects associated with inhalation occurred following chronic exposure in the workplace. No information was found on effects of boron after acute and intermediate inhalation exposures. Information on acute dermal exposure exist, but none was found on effects after intermediate and chronic exposures. In animals, information exists on the acute, intermediate, and chronic ingestion of boron. Those effects associated with inhalation of boron occurred following, intermediate exposures. No information was found on health effects of boron after acute and chronic inhalation exposures. Boron does cause health effects following acute dermal exposure. No information was found on health effects after intermediate and chronic dermal exposures.